Hi ladies! I have an awesome giveaway for you today! Marley Lilly has graciously offered to give away one of their gorgeous monogrammed scarves to one lucky Belle in the City reader! The winner will be able to choose from any scarf on their website. 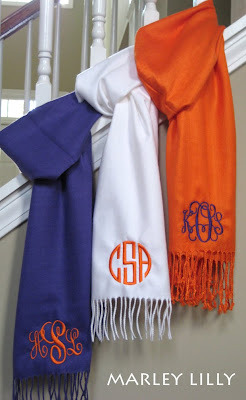 Y'all know how much I love a good monogram and these scarves are perfect for the holidays! You can leave all entries in ONE comment..the giveaway will end one week from today Friday, December 9th at 12pm. I hope I win!! :) I've been eyeing those scarves for a while! I like ML on FB. I follow ML on twitter. I like Marley Lilley on FB. I follow ML on twitter! 1. I follow your blog with GFC! 2. I like Marley Lilly on Facebook! 3. I like Belle in the City on Facebook! 4. I follow Marley Lilly on Twitter! So excited about this!! I love monograms! I also follow Marley Lilly on Twitter. I follow Marley Lilly on twitter. I love this giveaway! I've been wanting a scarf from her!! I follow your blog! And I liked Marley Lilly and your blog on FB! Nice! I would love to win this and give it as a gift! 5. Follow you on Twitter! so cute, I'm a follower of your blog! I liked ML on FB. I liked you in facebook! I follow Marley Lilly on Twiter! Ohhh! I LOVE ML! I got one of their "floppy hats" this summer! Thanks for hosting the give-a-way! This would be so fun to win! I was just trying to justify buying one as a pre-Christmas present to myself!! 1. I follow your cute blog! I like Belle in the City on Facebook. I follow Belle in the City on Twitter. 5. I follow you on twitter @JJCreasy! I'm a follower! Thanks for the fabulous giveaway! I follow Marley Lilly on Twitter! I like on you FB. I like Marley Lilly on FB. oooh I'm dying to own one of these! I love me some Marley Lilly! 4. I follow ML on twitter! I love Marley Lilly and these scarfs! Hope I win & good luck to everyone! Love ML soo much! Such a great giveaway! 1.) I follow your blog! 2.) I liked you on FB! 3.) I like ML on FB! 5.) I follow ML on Twitter! I really want one of these I hope I win! And I follow Marley Lilly on Twitter! I like Marley Lilly on FB! I liked ML on FB!!! I followed ML on Twitter!!! I Like Belle in the City on FB! I follow Belle in the City on twitter! I follow ML on FB. I follow via GFC! I also 'Like' ML on facebook! I follow your blog as well and have liked ML on FB. I don't have twitter because I don't understand it! Please let me know if I am a winner of one of these lovely scarfs! I do all 5 things! and I follow ML on Twitter! :] yayyy i love this giveaway! followed blog...liked on facebook...liked marley on facebook...and followed both on twitter!!! !